There never was and never will be a ‘perfect’ handgun, or a ‘perfect’ gun of any kind for that matter. Different gun owners have different needs that they look for their firearms to satisfy, as well as different qualities that they search for when choosing a gun. Therefore, the thought of an all-purpose ‘gun of perfection’ is nonsensical, as certain gun qualities which are subjectively preferable – weight, fire rate, ammo capacity – are contradictory. No two gun owners are going to have the exact same needs and living circumstances, and no two gun models are going to be exactly the same. Different guns accomplish the same goal (to fire a projectile) but employ different processes to do so. Having said that, there is still a wide range available in terms of quality in every class of firearms, and the fact is that some guns are inherently better than others. 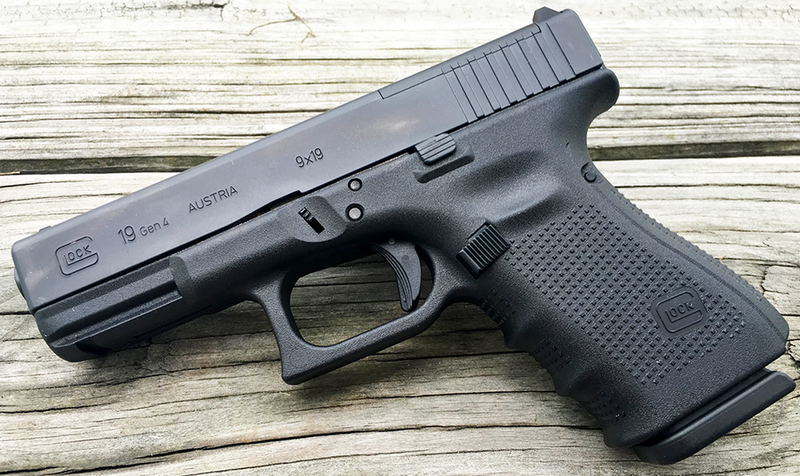 One of the higher quality guns in the world is the Glock 19 Gen 4, which we will review in this, our Glock 19 Gen 4 Review 2016. 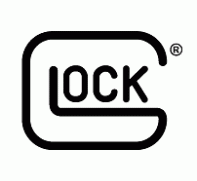 Glock, an Austrian gun manufacturing company, first began producing handguns in the early 1980’s, hitting it big with the release of their highly successful Glock 17 model. Named for the number of renderings it took before the ideal model was captured, the Glock 17 is one of the most revolutionary and acclaimed handguns in history due to its build quality, ease of use, and comfort in hand. 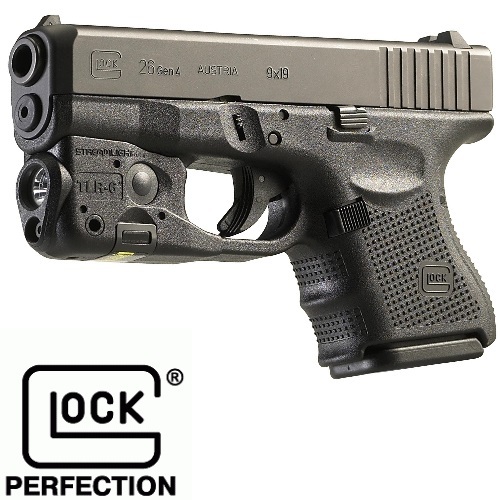 Having been made a best-seller due to frenzied buying from numerous law enforcement and military agencies around the world, as well as the general public (the gun remains a favorite for self-defense purposes), the Glock 17 put Glock on the map and gave way to its successor, the Glock 19, as we have covered in the past. Released in the late 1980’s and billed as a compact model of the Glock 17, the Glock 19 sports a shorter barrel and grip and has given way to three successors of its own since its introduction to the market – the Glock 19 Gen 2, Gen 3, and now Gen 4. The second generation Glock 19 features a textured grip and enhanced finish (check out our feature on Glock 19 finishes for more finish options), and the third generation Glock 19 offers a different grip, finger grooves for improved grip, accessory rails, and a thumb rest. In this review, we will cover the enhancements and features offered by the Glock 19 Gen 4, the latest and greatest in Glock’s long and successful line of handguns. Length: 7.28 in. – 185 mm. Height: 4.99 in. – 127 mm. Width: 1.18 in. – 30 mm. Barrel Length: 4.01 in. – 101 mm. Barrel Height: 1.26 in. – 32 mm. Loaded Weight: 30.18 oz. – 855 g.
Unloaded Weight: is 23.65 oz. – 670 g.
Trigger Pull: 5.5 lbs. – 2.5 kg. Trigger Travel: .49 in. – 12.5 mm. Length of Twist: 9.84 in. – 250 mm. Magazine Standard: Two 15’s with 10/17/33 options available. special to begin with. 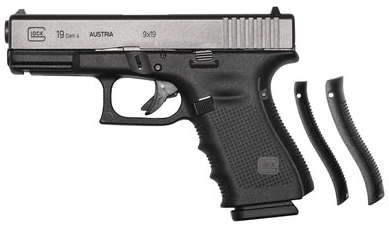 As previously stated, the Glock 19 was originally intended to serve as a compact, supplementary firearm to the Glock 17 model. It has certainly served as such, and admirably. The Glock 17 was praised for its reliability, build quality, and safety features – the Glock 19 has been praised for improving on the original Glock recipe for success in a number of ways, including; improved aesthetic and appearance, even easier to learn and enhanced safety features, and it is also an easier concealed carry choice due to the more compact build of the gun. 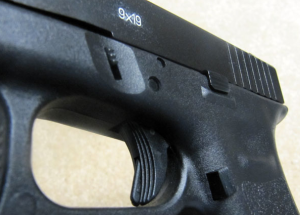 Like the second and third generations of the Glock 19, the fourth generation (or ‘Gen 4’) of the gun comes equipped with certain modifications that push the Glock standard even higher. A stippled grip, fully-replaceable backstraps, larger magazine release button, reversible magazine well for ambidextrous shooting, and a bigger internal spring are just a few of the enhancements that have made the Glock 19 Gen 4 the greatest entry in the Glock series to date. The signature feature offered by Glock handguns over the years has been the impressive build quality of their guns, and this is certainly lived up to in regards to the Glock 19 Gen 4. Made up of just 34 parts, which helps the gun run simply and smoothly due to the lack of parts that can conceivably become damaged, the Gen 4 features a build that is composed of mostly polymer-2, but incorporates steel as well. Originally criticized due to fears that it would be undetectable by metal detectors, Glock’s polymer formula is a well-kept trade secret. The polymer-2 material is, Glock boasts, more resilient than carbon steel as well as other materials that guns are generally composed of. 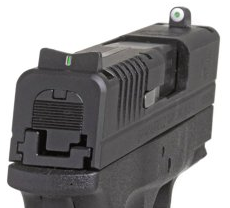 One element of gun manufacturing that Glock has always had down pat is that of their trigger manufacturing, and this is on full display in the Glock 19 Gen 4. The striker-fired gun employs a two-stage trigger which, unsurprisingly, is held to the frame of the gun by use of a polymer pin. Called the ‘Safe Action Trigger’ by Glock, the trigger features a level in its direct center which must be engaged in order to fire the gun – a handy and sensible addition that goes to show that Glock prioritizes safety in its firearms. At a relatively heavy but satisfying 5.5-pound pull weight, the Gen 4 trigger feels steady and true, even after having gone through extensive use. If a lighter pull weight is your preference, an alternative 3.5-pound trigger is offered by Glock that features a lighter, ‘hair trigger’ system. The Glock 19 Gen 4’s barrel is fairly standard, featuring a hexagonal shape and right hand twist. 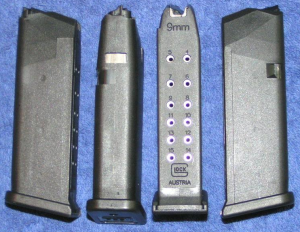 Glock employs a “hills and valley’s” shape to its barrel, which gives the barrel a smoother finish for more reliable firing. The comfort, feel, and grip of a gun is a category which is, for the most part, subjective. Different people find different guns comfortable, depending on their weight, size, grip, material, etc. 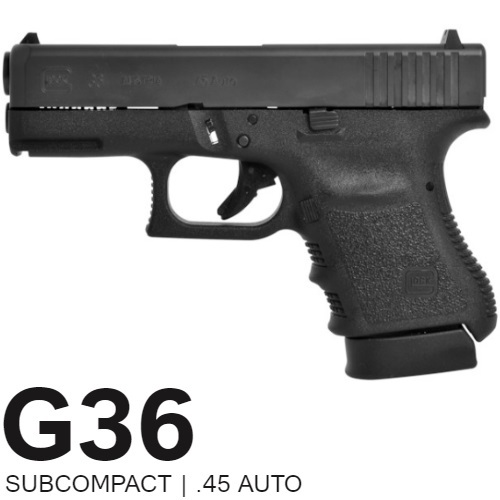 However, for the most part, the Glock 19 Gen 4 has been heavily praised for its comfort and grip options. For people with smaller hands, this gun will likely feel ideal – it has to be held to be fully understood, but the Glock 19 has been known to be described as a firearm that feels as though it’s an extension of the hand, as opposed to an object being held by the hand. 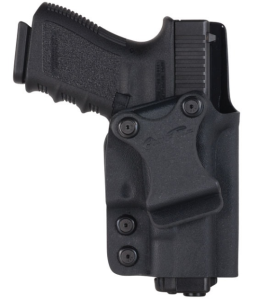 The plethora of customizable options for the Glock 19 Gen 4 given the removable backstraps offered, as well as the plethora of both first and third-party grip products available, means that despite the subjective nature of comfort and feel, everyone is likely to be able to find a setup that works for them. The Glock 19 has received praise from all over the world for being one of the most enjoyable-to-fire guns on the market, in addition to being maybe the most reliable handgun available for purchase. The replaceable backstraps offer fits that accommodate different shooters, the gun has excellent balance with a small, manageable amount of kick, and it is accurate even at a distance. This is part of why it is one of the most widely-used guns by military and law enforcement agencies. 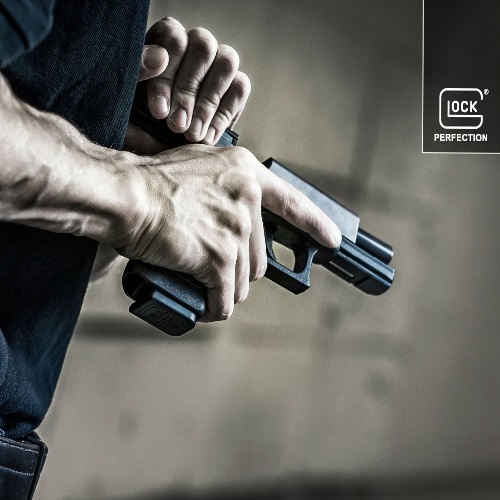 In addition to the handy ‘Safe Action Trigger’ that was previously described, the Glock 19 Gen 4 offers a number of other safety options which, combined with the trigger safety, make up what is known as Glock’s ‘Safe Action System’. The Gen 4 has a firing pin safety that is designed to prevent the striker from moving on its own, constituting an internal safety as opposed to the external trigger safety. Thirdly, the Glock features a drop safety which prevents the gun from being fired when dropped, regardless of the height of the drop. 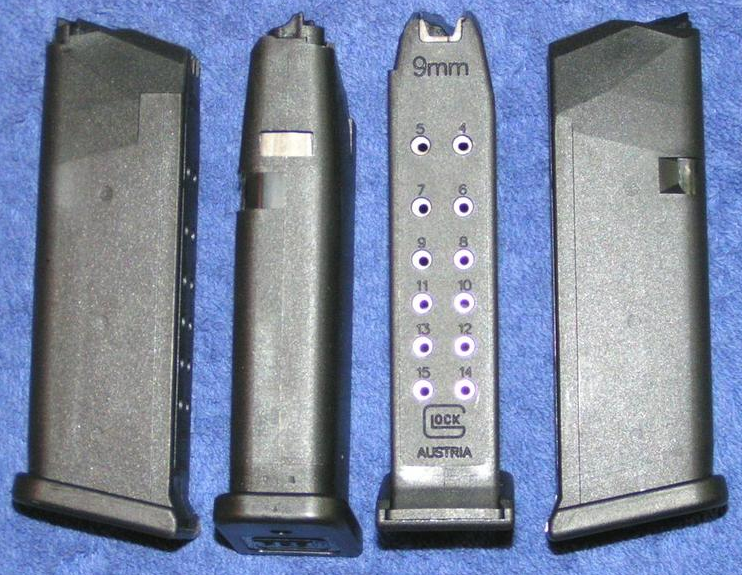 It’s also important to note that, again, the abundance of third-party external accessories offered for the Glock 19 is a very positive thing (note that this is not including accessories which are internal or implicate the inner-workings of the gun). In regards to safety, a number of handy, comfortable concealed carry holsters and devices are available for purchase which can go a long way towards ensuring the safe use of an already-safe gun. Check out our Top-10 Glock 19 Holsters feature for more information on Glock 19 holsters. Whereas some aspects of Glock’s handgun construction have remained relatively stagnant from the Glock 17 all the way through until the Glock 19 Gen 4 (if it’s not broke, why fix it? ), this is not the case in regards to the sights of Glock guns. Featuring fixed polymer front and rear sights, with white accents that ‘pop’ for faster target acquisition, the sights offered on the Gen 4 have come a long way from the mediocre sights offered on the previous Glock iterations. The white elements are especially helpful given that a huge percentage of gun owners use their gun for self-defense and home-defense purposes; given that most situations in which someone must defend their home occur at night, visibility is of paramount importance. Once again, it should be noted that there are a number of optional sight attachments and replacements available to best suit the needs of individual gun owners – like comfort, there is not one set solution that works best for everyone. Is the Glock 19 Gen 4 the perfect hand gun right out of the box, ready for use under any and all circumstances? Absolutely not. If that’s what you’re searching for in a handgun, however, prepare to be sorely disappointed. The Glock 19 Gen 4 is an excellent handgun in a long line of world-class handguns developed by Glock, and a worthy successor to the Glock throne. Almost all of the potential perceived shortcomings in this Glock weapon – grip or sights, for example – generally come down to personal preference, and you’d be hard pressed to find a handgun with more options for customization in subjective quality areas than the Glock 19 (check out our feature on the top Glock 19 modifications for more details, or check out the top-10 Glock 19 accessories). Whether for recreational use, law or military enforcement, or home defense, the Glock 19 Gen 4 is, quite simply, the class of the handgun category. Want to know how the Glock 19 matches up against other Glock handguns? Check out our Glock 17 vs 19 and Glock 19 vs 26 features to read all about it! Thanks for checking out our Glock 19 review. 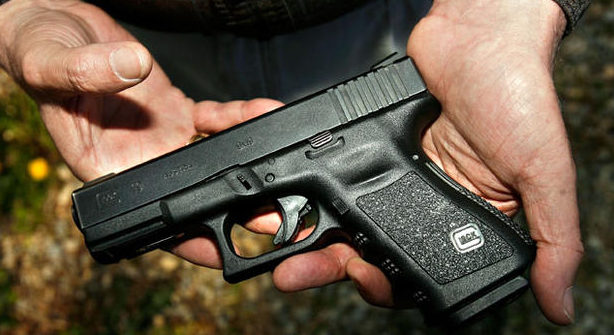 For more on Glock and all things guns, be sure to check back here at Gunivore! Glock 36 Review: Gotta Get Glocked!